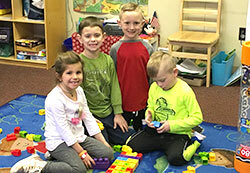 The Early Childhood Program at Alpha House is well defined and structured to include the academic, physical, spiritual, and organizational development of young children. Our children learn by teacher guidance and through individual self-exploration. The development of a feeling of security and positive self-concept is an integral part of our program and is nurtured through the dedication, interest, motivation, and personal qualities of the teachers. Our children benefit from the resources provided by the Holy Family University and surrounding community. We of Holy Family University, a Catholic institution, believe that the whole child should be developed. Should be exposed to an atmosphere of love so that they will gain love and respect for God and neighbor. Should accept and appreciate differences in others. Should be provided with a proper physical setting to allow exploration and discovery. Should be given opportunities for self-expression and auditory development. Should be given experiences that will enable them to function in our technologically challenging world. Should be provided with experiences to develop concepts in emergent literacy and number meaning. Should be given activities and materials that are developmentally appropriate. Alpha House is a private Catholic Nursery, Pre-K, and Kindergarten on the campus of Holy Family University. The curriculum at Alpha House is designed to include basic skills and their development within the content areas. The teachers recognize that student’s progress at different levels and adjust their lessons accordingly. Group instruction, individualized instruction, and cooperative learning are incorporated into our curriculum. Realizing that each child is unique and that in today’s society children come from diverse backgrounds and family structures, our faculty attempts to honor that diversity while at the same time celebrating that which binds our families together. Alpha House administration and faculty are committed to creating an atmosphere conducive to the growth and development of the whole child, spiritually, emotionally, and academically. With this in mind, Alpha House teachers dedicate themselves daily to the pursuit of excellence in all endeavors.